Start any new golfer on the right foot with the Callaway® Starter Gift Set. A fleece-lined valuables pouch features embroidered Callaway® graphics and protects important items, while a divot repair tool teaches them proper care for the course. A ball marker pen with Pro-Line putt alignment tool helps them find their putting stroke on the green, while two golf balls, five tees, and poker chip marker equip them for their first round. 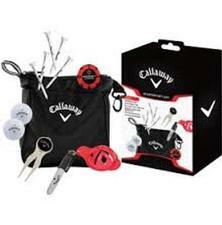 If you have any more questions about the Callaway Golf Starter Set (Includes: Pouch, Align Tool, Divot Tool, Chip, Balls, Tees); do not see the model you are looking for; need custom options; or prefer to not purchase online, then please call us at (630) 656-1291.